Bethune-Cookman University has towered like a colossus over the PGA Minority Collegiate Golf Championships in recent years. The men’s team has won the tournament’s Division I category four of the past five years, while the women have taken the top spot six years in a row. But Bethune-Cookman’s golfers hardly look like what you might expect from a historically black college or university (HBCU). As the school pursues another minority collegiate championship in May, its nine-person team will have just two African-American players, the same number as it has from both Sweden and Ireland. The four-member women’s team has one black golfer. The situation is much the same across the shrinking landscape of HBCU golf, as coaches struggle to find African-Americans with the skills to play the sport competitively. Such a reality seemed unlikely when Tiger Woods reached the summit of the golfing world with his dominating win at the Masters Tournament in 1997. Woods’ 12-stroke victory at golf’s most prestigious tournament, coupled with his long run as the undisputed king of the game, prompted predictions that he would inspire a torrent of top black golfers. Instead, the reverse has happened. As the mixed-race Woods returns to the Masters this week, there is only one other golfer with African-American heritage on the PGA Tour: Harold Varner III. But even more surprising than the shortage of black players on the top professional tour is the dearth of competitive black golfers at the nation’s HBCUs. The dynamics shaping HBCU golf teams resemble those that have altered the complexion of many HBCU baseball rosters. As fewer black athletes play high-level youth baseball, more white, Latino and foreign players have stepped into the void. The shortage of black golfers is evident in HBCUs across the country. The reigning champion of the Mid-Eastern Athletic Conference (MEAC), which is made up mostly of HBCUs, is not even a black college. Augusta University, a predominantly white school with no black players on its golf team, has won the MEAC three years in a row. Last year, Augusta demolished its MEAC competition, winning the conference championship by 36 strokes in 54 holes of play. Overall, about 40 percent of the men listed on the rosters of MEAC golf teams appear to be black. 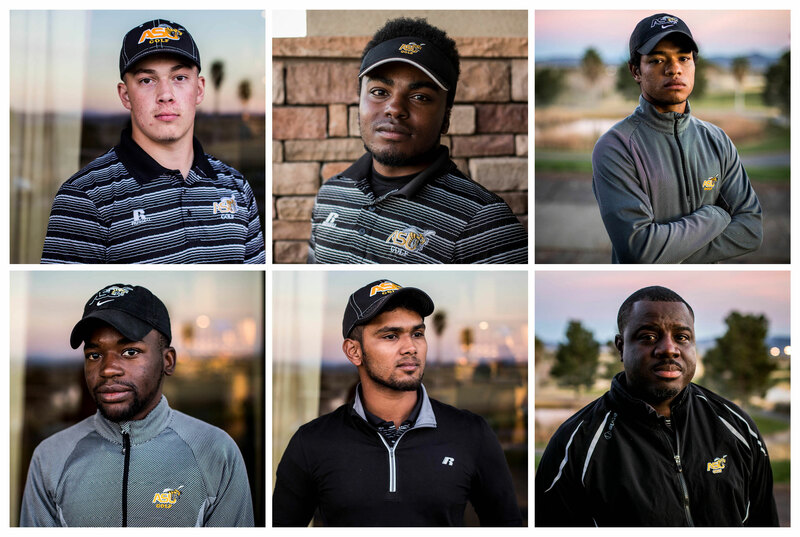 In the Southwestern Athletic Conference, too, fewer than half of the male golfers are black. Among women, there is a higher percentage of black golfers on HBCU teams, a disparity that one coach said ebbs and flows over time. At MEAC schools (which do not have enough women’s teams to formally compete for a conference championship) and in the Southwestern Athletic Conference (SWAC), about two-thirds of the female golfers appear to be African-American. Golf coaches, industry executives and collegiate players offer a range of explanations for the shortage of competitive black golfers. There are the ever-present problems of economics and access to golf courses and equipment. But the challenges confronting HBCUs run deeper. Financial problems have prompted several HBCUs, including Grambling, Jackson State and Mississippi Valley State, to drop once highly regarded golf teams since 2010. Meanwhile, the schools that remain in the game are vying for a tiny number of young black golfers who have played against elite competition on tough courses, which helps mold recreational players into competitive ones. Alabama State juniors Noel Sims and Mbongeni Maphosa take a break during a practice round at the Boulder Creek Golf Club before tournament play in Boulder City, Nev., March 8, 2018. 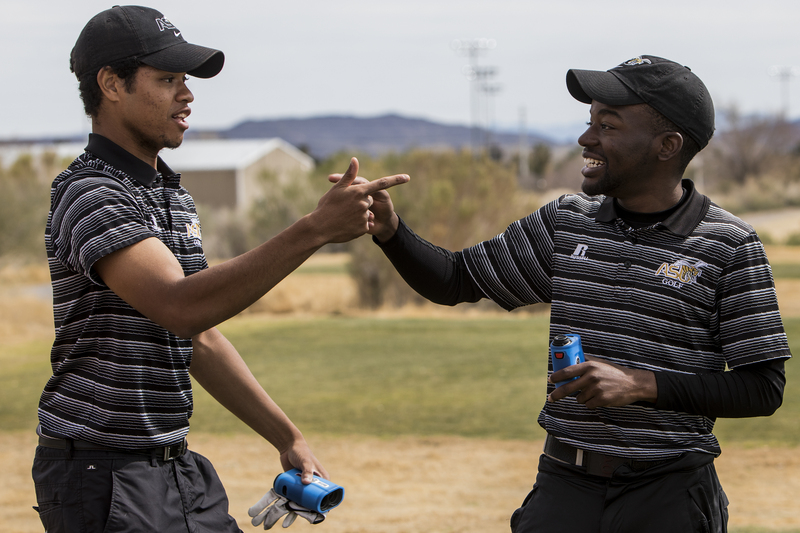 Alabama State University, a HBCU in Montgomery that has won six consecutive SWAC golf championships, had two African-American men on the five-member travel team that competed at last month’s Jackrabbit Invitational tournament outside Las Vegas. They played alongside a white teammate from Canada, a South Asian from Bangladesh and a black teammate from Zimbabwe. “It is very difficult to recruit the level of talent you need to be competitive,” said Alabama State coach Gary Grandison, who has led the once flailing Hornets team to golf prominence over the past 11 years with teams that were often only half black — or less. “There is talent in the black community, but not the training,” Grandison said. Programs such as The First Tee have introduced millions of young people to golf over the past two decades. Many big-city recreation departments operate golf courses that offer people of modest means the chance to play. And more than a handful of public schools have golf teams. But it generally takes more than that to play at the collegiate level. Golfers have to get used to competing in big-time tournaments against good players, on challenging courses with the high rough, elevated greens and difficult fairways not often found on public courses. The Alabama State University golf team. Top row from left: Freshman Alexandre Belanger, sophomore Quincy Stith, junior Noel Sims. Bottom row from left: junior Mbongeni Maphosa, freshman Afnan Chowdhury, team coach Dr. Gary Grandison. Quincy Stith, one of the two African-Americans on Alabama State’s travel squad, got started in the game when his father took him and his sister (who played golf for Jackson State) to a local course to hit balls. After high school, he left his hometown of Wichita, Kansas, to spend a year at a golf academy in South Carolina. There, Stith, a powerful left-hander, raised his game enough to attract Grandison’s eye. While HBCUs are known for developing previously untapped academic potential in the classroom, the same is not true when it comes to golfers on the highly competitive college circuit. Grandison is looking for top talent with the attitude and acumen to excel both on the course and in the classroom. He scours the junior circuits for players with big-tournament experience. He doesn’t have a lot to offer: partial scholarships to a proud but financially strapped university, and a chance to compete and develop their games under his tutelage. Grandison said his goal each year is to field the best collegiate golf team in the country, and one that is academically strong. Some of his teams have been nationally ranked, and their collective GPA has hovered near 3.5 since the former marketing professor took charge of the golf program. Still, to be competitive on the links, he has reached far beyond the African-American community and recruited whites and foreign players. Alexandre Belanger, a native of New Brunswick, Canada, said he did not even know what the acronym HBCU stood for until months after he had enrolled at Alabama State. Grandison found Afnan Chowdhury two years ago in Jacksonville, Florida, where he had come from his native Bangladesh for golf instruction. Chowdhury began winning junior tournaments before he was 10 years old. He gave up cricket and soccer and started playing golf with the men when he was 12. “I knew just a little about HBCUs, that they had a rich history,” the freshman finance major said. He saw Grandison as a top-flight coach who would help him reach his goal of being a professional golfer. So he came to Alabama State, where he was surprised by the racial makeup of many HBCU teams. “It’s kind of weird that they don’t have more black golfers,” he said with a shrug. Alabama State freshman Afnan Chowdhury plays during a tournament at the Boulder Creek Golf Club in Boulder City, Nev., March 9, 2018. 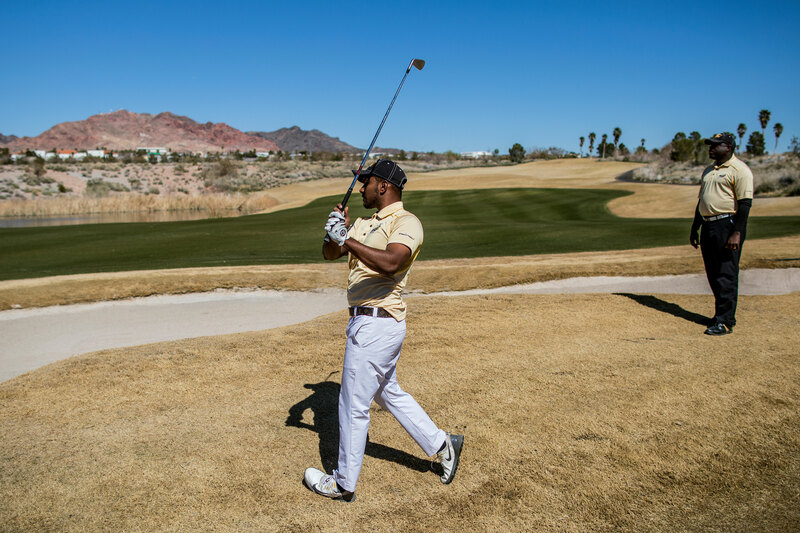 Noel Sims, a junior communications major who came to Alabama State after attending community college, was something of a golf prodigy growing up in Arizona. His father put a club in his hands at age 2, and he was among a small handful of black players who were regulars on the junior golf circuit. “Everyone kind of knew each other,” he said. Grandison’s own golf background is unlike those of many of his players. He grew up near a course in his hometown of Pritchard, Alabama. He played basketball and baseball in high school. But he took to golf, which he learned by playing every time he got a chance. He went on to be captain of Alabama State’s golf team before graduating in 1997. 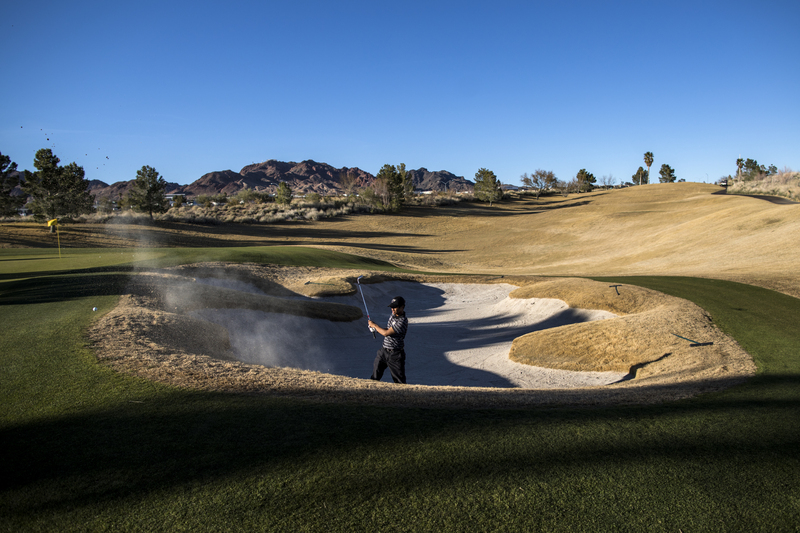 Alabama State junior Noel Sims takes a practice round at the Boulder Creek Golf Club before tournament play in Boulder City, Nev., March 8, 2018. Alabama State was the only HBCU in the 15-team field at the Jackrabbit Invitational, which included golf powers such as UCLA and UNLV. The beautiful course is framed by mountains in the distance and has fairways split by desert scrub and deep creek beds, and it is pitted with deep sand traps. Playing well requires precision as much as power — a point Grandison emphasized as he wheeled his golf cart around to coach his golfers during his team’s practice round. “I might have to get you guys drug-tested,” he joked after his players blasted one towering drive after another. As his players make their way through the course, Grandison turns serious. He warns that on many holes they might not want to be aggressive off the tee. They should maybe use their less powerful woods, rather than drivers, before aiming for the greens on their second shot. Later, he fretted that his young team might not be ready. They were too eager to attack every hole, rather than playing more strategically. The Hornets found themselves playing from hazards far too often and placed last at the tournament, 91 strokes behind champion UNLV. 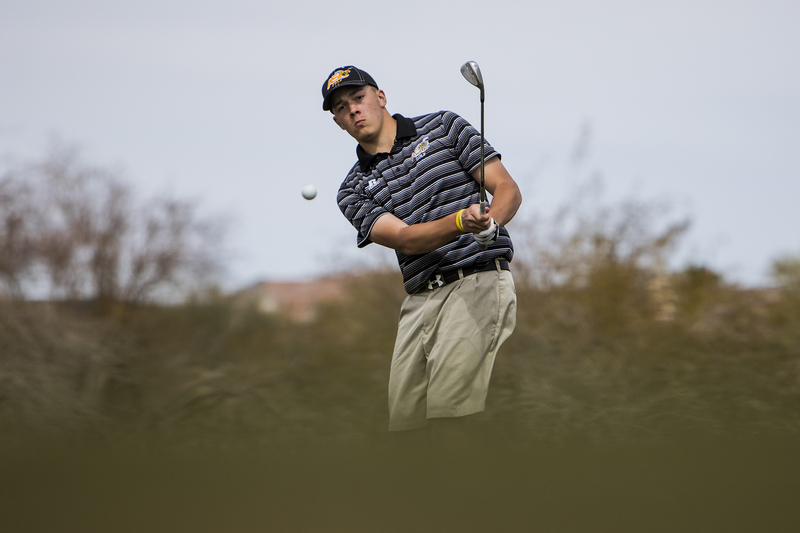 Alabama State freshman Alexandre Belanger at the Boulder Creek Golf Club in Boulder City, Nev. , March 9, 2018. The shortage of African-American golfers at the game’s highest level is an unexpected development, given the estimated 1.4 million recreational black golfers in the country, as well as the long history of African-Americans in the sport. George Franklin Grant, a dentist and first African-American faculty member at Harvard University, is credited with inventing the wooden golf tee in the late 1800s. In 1896, John Shippen became the first black man to pay in the U.S. Open. He was vying for the lead before his drive on the 13th hole of his final round strayed off the course and onto a sandy road. Shippen ended up finishing sixth, earning $10 in prize money. Charlie Sifford became known as the Jackie Robinson of golf in 1961 when he became the first African-American to play on the PGA Tour. By the mid-1970s, there were about a dozen black golfers on the tour. Golf’s overall popularity has fluctuated since, seemingly waxing and waning with Woods’ successes and failures. The number of golfers in the country ballooned from 24 million in 1996, the year before Woods’ historic victory at the Masters, to 31 million in 2003. The numbers have dwindled since. In 2016, there were 23.8 million golfers in the U.S. — 4.6 million of whom were nonwhites, according to the National Golf Foundation. One sliver of hope for those interested in seeing more top black golfers is that nearly a third of those who played golf for the first time in 2016 were minorities, according to the National Golf Foundation. But it is anybody’s guess how many of those novices will go on to play the game competitively. Meanwhile, HBCU coaches will continue looking for talent wherever they can find it.